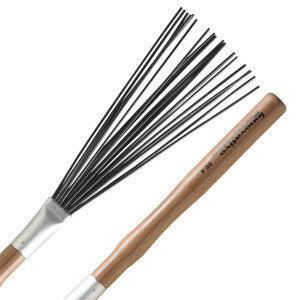 The BR4 Heavy Nylon Brushes with heartwood hickory handle are thick and stiff for crisp articulation and extra volume. These brushes would be used more as an "effect" and also work very well in the marching application. The wood shaft features a notched fulcrum that creates a great feel and balance. The non-retractable shaft allows for a wide spread and great consistent attack sound.